Last night on Pawn Stars, Rick Harrison, the shop's owner, went against his own rules and in the process got taken for $13,000. That is a lot of money no matter what way you slice it and quite frankly Rick knows better. When presented with a copy of the book, "Say It Ain't So Joe", supposedly signed by the legendary player, Rick didn't hesitate to begin negotions all the while saying, Joe Jackson was illiterate and few of the signatures on the market are actually legit. After he acquired the book, the Old Man, visibly upset, sent him to their rare book dealer who after showing him a known example of Jackson's signature had to break the bad news to Rick. Submission to PSA/DNA did not help Rick's case either and now he is stuck with a bogus autograph. Knowing that no business person can afford to take a loss like that, my concern is, what is going to happen to that autograph now? Here is the only known example of a "Shoeless" Joe Jackson signature that all the major authenticators can agree upon as being legit. The ONLY one and yet how many have we seen in the marketplace in recent years? He can sell it fake but "as seen on tv" and get a few extra bucks out of it. Even though we all know the autograph is fake, Rick should still send the autograph to another authentication grading company to see if he learns anything new about the autograph. Hopefully any other company won't tell him that the autograph is real. What I can't understand is how Rick could make such a rookie mistake (personally, I would never buy that autograph for that kind of money)? Didn't he get any help from a autograph expert? How hard would it be for him to buy a book on autographs or ask other collectors online (like at autographmagazine.com) or in the neighborhood if they know anything about real autographs? And no offense to the old man, Corey, or Chum Lee (they do the best they can, but when they are stumped...), but would it hurt Rick's business to hire a collector of memorabilia, artwork, etc., to tell him the real from the fake? Well Rick, if want to hire any collectors, give us a call! This show is as fake as the signature. I think the real issue is how the few times Rick has gotten burnt real badly is because he was greedy in not bringing the appraiser into the shop so the seller would find out that the book is really worth $100,000 if authentic. Before the history channel started filming in the pawn shop, Rick would never allow sellers to be present in front of the appraisals of his experts that he brings in. This doesn't sound like Rick .. He checks out more common autographs and doesn't appraise the rarest autograph in the industry??? I think the show needed to show that Rick doesn't always win so they rigged this "loss" to try to convey the image that Rick is wrong sometimes as well. I mean really ... I cannot emphasize how much of a con job this "loss" is to the audience. He calls in appraisers for $200 signatures and nobody for this one? There is no such thing as "reality tv". Sell it as the item that fooled Pawn star Rick Harrison! $$ Might get some interest for that. All the Best. A fan of your show. This signature did not fool Rick. This is a television show! The whole thing is scripted, written for tv. The producers decided this would make for a good show, period. Discussing why Rick did this is like asking why Fonzie said "Ayyyy" when he walked in a room....it makes for good tv. That is it. 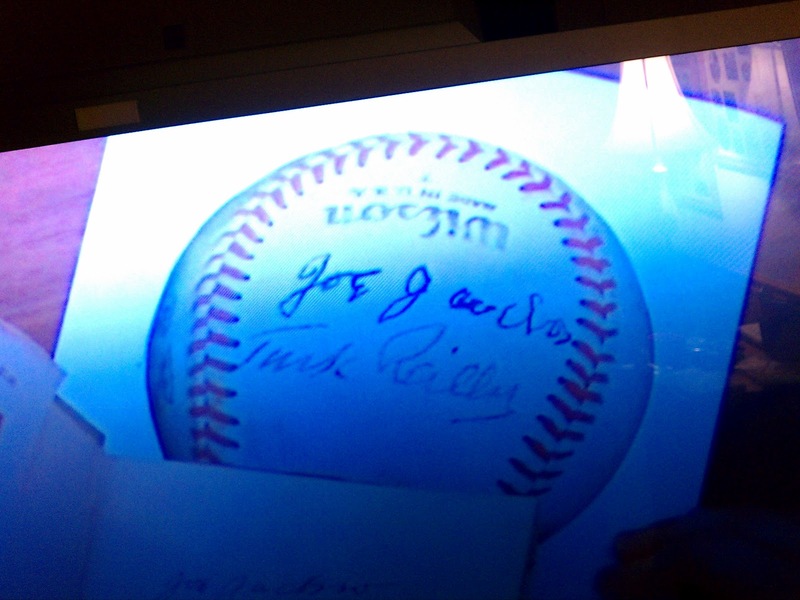 two different surfaces, two different forms and two different signatures by a baseball player who had trouble writing. Baseball is hard, round and made of a leathery material (sorry not an expert). A book has a binding, paper and is flat. Do you possibly think there might be a slight difference in the signature?